Ian Hames was not the only Broadstairs player to emerge with credit from the Thanet Congress last weekend. Reg Pidduck’s 3/5 was not quite enough to win one of the main prizes in the Minor section but it was enough to win the Oyster Shield. This prize is awarded to the Thanet senior player with the highest score in the Intermediate or Minor sections. It was first awarded in 2011 having been donated to the Congress by Whitstable Chess Club. The club folded the previous year and wanted to leave something tangible as a legacy and with Whitstable famous for its oysters, the choice of name was not a difficult one. Reg not only won the Oyster Shield this year but he was also the first winner in 2011 and in two of the other four years in between. Well done! I have not been able to track down any games from the Thanet Open. I would especially like to feature one of Alan Merry’s victories but if anyone reading this can supply a game or two, or suggest how I can access the games, I should be grateful. Ian Hames had a memorable Congress, sharing first place in the Major with a performance grade of 186. He claims he was the beneficiary of more than his fair share of good luck but I have always maintained that luck plays a crucial part in most tournament wins, especially at our level. Here is a game that owes more to perseverance – by both players – than luck, demonstrating that one of the drawbacks of Fischer time in a weekend congress is the possibility of one round crashing into another. This game only finished thirty minutes before the start of the next round. 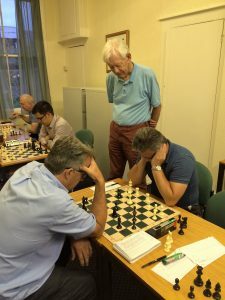 The 47th Thanet Chess Congress took place last weekend August 19th-21st at Canterbury Christ Church University in Broadstairs. 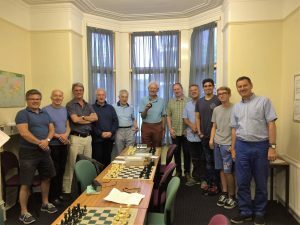 Congratulations to Alan Merry of Bury St Edmund’s Chess Club who took first place in the Open with 4½/5, and to our own Ian Hames who finished joint first in the Major with Kevin Smyth of Folkestone on 4/5. The Intermediate section resulted in a three-way tie between David Gilbert (DHSS), Derek Hadley (Greater London) and Gavin Josephs (Dartford and Swanley) with 3½/5, and the Minor was won by Alan Fraser (Beckenham and Bromley) with 4½/5. All the results can accessed by clicking here and I hope to feature some of the winning games in the near future. In the meantime, here is a neat finish from the Intermediate by Michael Page, once of this parish and now of Reading Chess Club. 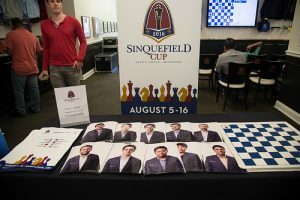 The latest stage in the Chess Grand Tour, the Sinquefield Cup, has been taking place in St Louis this past week featuring as usual ten of the strongest players in the world although minus Magnus Carlsen and Sergey Karjakin, busy preparing for their World Championship final in November. The format is a round-robin and players compete for $300,000 in prize money, with $75,000 for first place, and points toward the overall Grand Chess Tour. The problem with round robins involving such large sums of money – as we have found in the past – is that players tend to err on the side of caution and wins come at a premium: only nine out of 35 games played so far with three rounds ending entirely in draws. With only two rounds to go, Wesley So leads with 4½/7, perhaps largely because he is the only player to have won more than one game so far. The upside of this is that with only one point separating the top eight players, the final two rounds may provide some exciting chess. It has been suggested that three points for a win in closed competitions might encourage more attacking chess. No Wei Yi for us to follow in this tournament so here is Ding Liren’s only win so far. $75,000 will not be the first prize at next weekend’s Thanet Chess Congress but that is no excuse for you not to enter. There is still time to do so and if you have not been to Broadstairs in the summer, now is your opportunity. Unlike many venues, the Canterbury Christ Church University is clean and air-conditioned, the food in the canteen is delicious and well-priced, and it is a comfortable room to go through your games. If you are not chasing the money, why not take a bye and relax on the beach for an hour or two. As with last year, I shall be inviting players to send in any of their games they feel are worthy of a greater audience. There is no ‘best game’ prize but we were sent some fine games last year and I hope we can receive the same this time. Games can either be sent via the ‘contact us’ page on this site (algebraic notation, please) or copies given to the controller during the Congress. It would be ideal if we could have examples from all four sections and I shall publish as many as possible soon afterwards. For more information on the Congress including entry forms and online registration, please go to www.thanetchess.org.uk. In the picture from left to right are: Paul Carfrae, Reg Pidduck, Bob Cronin, Michael Doyle, David Clifford, David Horton, Nick McBride, John Couzens, Jordan Leach, Ronan Doherty and Bob Page. Also present that evening although arriving too late to be in the photo were Michael Jenkinson, David Faldon, Andy Flood and Ian Hames, not forgetting Brian Gutierrez who took the photograph – an impressive turnout for August, a month when many clubs have already been closed for three months. David had already ensured that he completed all his obligations to the club competitions and, as leader in the clubhouse, he may yet finish his final season in style by winning the Goodall Cup fifty years after he won it for the first time. He stayed long enough to cast an eye over some of the games taking place – on the right are John and Paul playing their final Goodall Cup match – before bidding farewell with handshakes all round.